18.88% more cruise and stay-over visitors came to Grenada in 2014 than in 2013, revealing an increased interest for travel to the beautiful tri-island state. 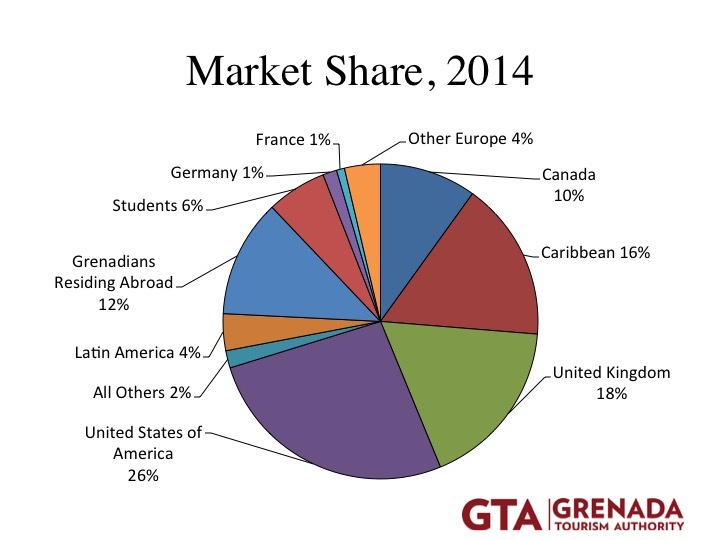 Cruise is one of 5 main market niches for Grenada, with 3 ports of entry for cruise ships. 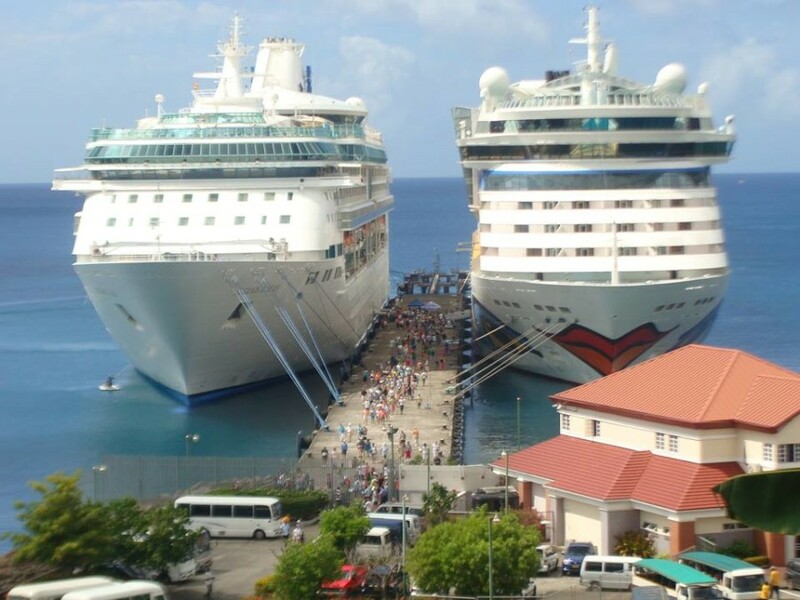 156 cruise calls brought 235,140 passengers to Grenada in 2014, contributing an excess of EC$26 million to the economy. Last year, ports at Grenada and Carriacou welcomed a total of 11 inaugural cruise calls, with 2 during the months of July and September after a long hiatus. There were 133,521 stay-over visitors in 2014, an increase of 18.36% or 20,709 in real terms when compared to 2013. These stay-over arrivals added over $347 million to the economy. On average, Maurice Bishop International Airport receives 340 inbound flights from major cities in the USA, the UK, Canada, Germany, Latin America, and the Caribbean. Visitors came to Grenada, Carriacou and Petite Martinique mostly for leisure, vacation, visiting family or friends, weddings, honeymoons, or business. The majority of persons that came last year for weddings and honeymoons were from the United States of America, while 90% of visitors who came for business and conventions were from the Caribbean. Venezuela proved to be an emerging source market for visitors to Grenada. In 2014, 289.38% Venezuelans flew to Grenada on the airline, Conviasa which increased its airlift to two weekly flights last year. These South Americans tend to travel in groups and learn of Grenada via word of mouth. 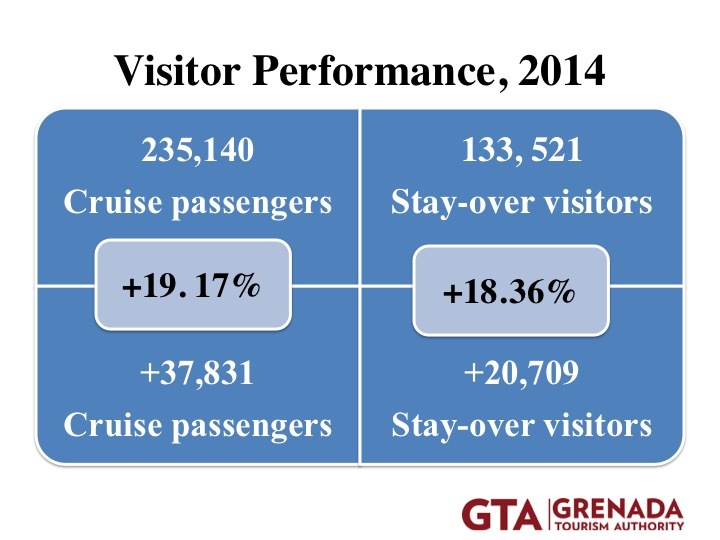 The Grenada Tourism Authority (GTA) presented a statistical overview of 2014 at its press conference yesterday at its headquarters on the picturesque Carenage, St George’s. “Destination Pure Grenada — the Spice of the Caribbean is being recognised more in the marketplace, due to the work of the Grenada Tourism Authority and all our stakeholders. My fellow directors, managers and officers of the GTA thank you all for your dedication to developing our tourism sector,” remarked Mr Richard Strachan, Chairman of the Board of Directors, GTA.